Brick Town Talk: I Can See for Miles and Miles... - LEGO Town, Architecture, Building Tips, Inspiration Ideas, and more! London, England- (BTT) Glasses are a really great invention, without them we would all be moles, with no sense of vision, feeling around our blurry surroundings with only our nose as a guide! While minifigures have had glasses since the first variation from the classic smile, they've never had somewhere to get them, until now! 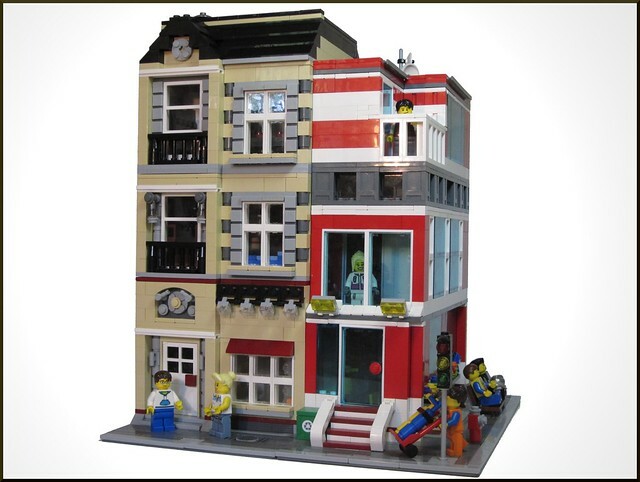 The Brick Glasses Shop is the #1 destination for minifigs of all sizes when less than 20/20 sight is not an option. With 3 fully furbished floors, including, but not limited to, a bathroom, kitchenette, and dumpster, this building is chock full of detail. And it's partner doesn't look bad either! Full disclosure, this is my own MOC, but it absolutely destroyed my collection of tan bricks, to the point that I had to use two trips to a Pick-A-Brick wall to get the necessary parts. It's also the main reason why I've been posting somewhat infrequently lately, so I promise more juicy Modulars to come your way soon!